For at least 7 years, perhaps even 10, the new stadium in Budapest will be called Groupama Arena. Many are happy with the contract, but others argue that this has and will be Albert Flórian Stadion. Yesterday Hungary’s most popular club confirmed what has been speculated about for the last month. 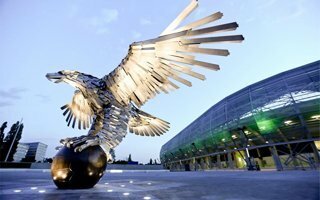 Ferencvaros revealed the country’s first naming rights deal for its new stadium by Budapest’s southern bypass. For no less than 7 years the building will be known as Groupama Arena, but the French insurance company has an option of prolonging it by further 3 years. Value of the cooperation hasn’t been disclosed. Partnership means that the publicly funded stadium will not be a burden to authorities once Ferencvaros moves in as anchor tenants. And though its construction budget remains tight (despite growth from HUF 13.5 to 14.7 billion), many taxpayers aren’t happy that a private club like Fradi received such a venue. Thus many welcomed the Groupama deal. Others, particularly more traditional football supporters, aren’t that happy about name change. It’s worth keeping in mind that the previous stadium on the site was called Albert Flórian Stadion, honouring the club’s most legendary figure. Albert had a statue at the old ground and was cherished by fans like no other player. When he passed away in 2011, the stadium filled to capacity with fans holding candles in a silent vigil. However, Ferencvaros assures memory of Albert will never fade, even with the name change. His sculpture should be revealed shortly, while the road leading to the stadium and the public space around it will both be named after “Uncle Flóri”. The naming rights deal isn’t the only set of good news in commercial terms. Ferencvaros already managed to sell half of the 32 skyboxes (there are 34, but 2 weren’t for sale) for a period of 3 years. And just within the first week of season ticket sales 4,000 people booked their seat for a fee between HUF 27,000 to 100,000 (€87-320 / $118-438). Official opening is scheduled for August 10 with a friendly game against Chelsea. Signing a team like that for opening wasn’t cheap, but great demand suggests – according to Fradi officials – that the game will be profitable.